Put your feet up, grab a book, and let the scenery soothe you. There's just something about gliding down one of the United States' greatest rivers that calms the soul. 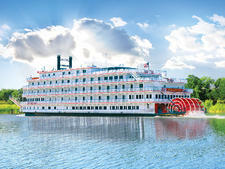 Originally built for the Mississippi River - and named Queen of the Mississippi - American Pride began its life in 2012 exploring cities like St. Louis, Memphis and Louisville. 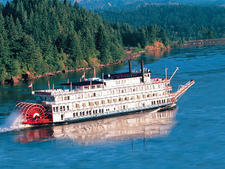 In 2016, the line renamed the paddlewheeler and moved it to the Snake and Columbia rivers for itineraries that focus on Lewis and Clark, as well as Pacific Northwest cuisine and scenery. 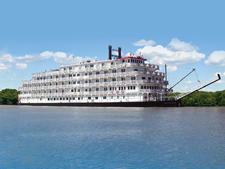 While Cruise Critic sailed on the ship's Ohio River itinerary, most of the vessel's attributes have stayed the same. Onboard, the service is superb, which is somewhat surprising, considering American Cruise Lines' employment policy limiting waiter/room attendant contracts to three months per any nine-month period. The mostly young crew, therefore, is new to the job, though they make up for any lack of experience with friendliness, an eagerness to serve and a genuine interest in your well-being. The food is excellent, the accommodations spacious and comfortable, and your fellow passengers, of which there are only 150, are keen to meet you and chat. With no assigned tables, you quickly get to know the majority of others on the boat. It might feel unbelievably small to anyone who's only been on a giant cruise ship. If you're looking for a lot of activity, you're not going to find it here. 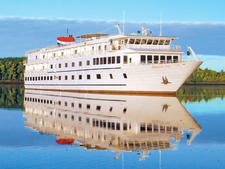 Onboard life is geared toward the older crowd. All activities are seated, from listening to lectures and enjoying some golden oldies tunes to participating in a marathon jigsaw puzzle contest. At times, we craved a stroll around a nice promenade deck. But despite our occasional need to get up and move, we found it quite enjoyable to sit at the front of the boat in a rocking chair watching for birds, chatting with new friends or reading a book. 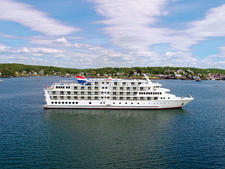 American Cruise Lines attracts an older demographic. (The average age is probably 72 or so.) The fact that the ship has an elevator is a highlight for many. Hailing from all over the United States -- Alabama, California, the Carolinas, Ohio, Florida -- passengers represent a geographic cross section of the country. 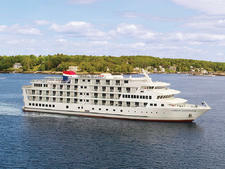 More than 40 percent of the passengers have been on at least one American Cruise Lines cruise before. Casual resort attire is de rigueur, both on the ship and ashore. For dinner, men's clothing might include a sport shirt and slacks with a sport coat or sweater. Women might find a sweater and slacks or a dress appropriate. American Cruise Lines also recommends you bring comfortable walking shoes, a hat, light rain wear and a jacket for cool evenings. Gratuity is at your personal discretion. 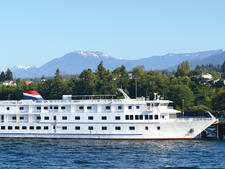 Tips are generally given to the Hotel Manager near the end of the cruise. They are then divided equally among the stewards and deckhands. 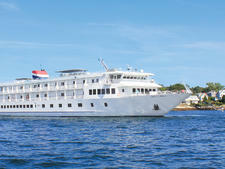 Tips generally average about $125 per person for a seven-night cruise. Stewards and deckhands do not expect and cannot accept tips directly. Credit cards, personal or travelers checks, and cash are accepted. 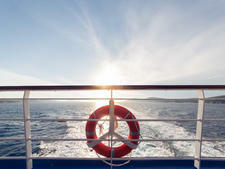 If you choose to pay by credit card, please contact the Hotel Manager at least one day before the end of your cruise. 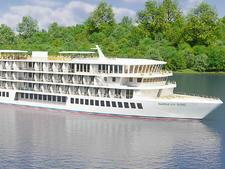 The made-in-the-USA, 163-passenger American Constellation, the newest ship from American Cruise Lines, set sail in spring 2017.